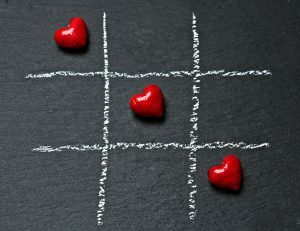 Psychological flexibility (PF), a core principle of Acceptance and Commitment Therapy, is defined as a non-judgmental disposition that acknowledges and accepts the circumstances of life, both good and bad, and the commitment to behavior that sustains and enhances what is meaningful and valuable to us. One of ACT’s six core processes is self as context. Self as context is the classic observer stance; to notice who is noticing what, within the various domains of experience (1). It is the ability to observe thoughts, feelings, and emotions that we have about ourselves. In many ways, the experience of chronic pain can undermine this ability. 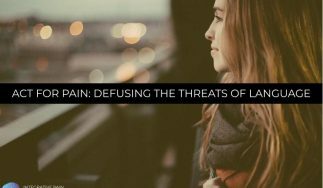 Persistent pain often becomes a ‘guiding theme’ that displaces joy, erodes self-confidence, and puts a strain on relationships. ACT suggests that while pain hurts, it is the struggle against pain that causes suffering. A re-examination of the “thinking self” versus the “observing self” is part of ACT’s strategy to reduce pain, suffering and to live better. For more on this, check out our post, ACCEPTANCE AND COMMITMENT THERAPY (ACT) FOR CHRONIC PAIN. Self-identification with the content of one’s psychological experiences, namely all the beliefs, thoughts, feelings, and images of oneself (“I am this, think I am”). This process is also known as cognitive fusion. The awareness of ongoing experiences related to the self. People with chronic pain also struggle with their sense of self, and this struggle has elements derived from both cognitive fusion (self-as-content) and experiential avoidance (3, 4). Listen to this podcast HOW TO AVOID THE TRAP OF NEGATIVE THINKING USING ACT, with Dr. Kevin Vowles, PhD. Over-attachment to self-as-content may lead to avoidance. 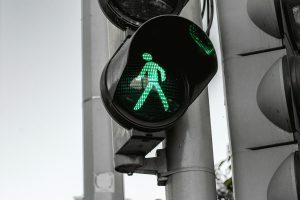 In contrast, self-as-context, facilitated by the awareness of ongoing experiences (self-as-process), can promote commitment to more effective and engaged patterns of behavior which are in line with one’s life goals and values. “Metaphorically speaking, self as context is like a perspective one can take on one’s thoughts and feelings; a perspective that includes a distinction between self and these experiences, a sense of self as “container” of one’s thoughts and feelings, or like a “place” where one’s thoughts and feelings occur” (5). Is Assessing Self-As Context Problematic? The SEQ was applied in a 2017 study by Lin Yu, S. Norton, and L. McCracken that appeared in the Journal of Pain (6). It examines whether self-as-context changes over time after an interdisciplinary ACT-based pain treatment program and how this change correlates with several measures of well-being in patients with chronic pain. Among participants, 50.5% (n = 208) were out of work because of pain; 14.1% (n = 58) were retired; 14.3% (n = 59) were working full-time, and 9.5% (n = 39) worked part-time because of pain. Self as Context: Assessed using the Self Experiences Questionnaire (SEQ) (5). 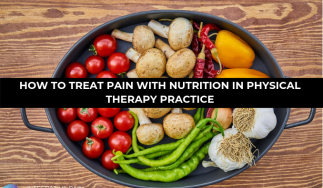 The treatment program was delivered over 4 full days per week, for 4 weeks, in a group format (9 to 11 participants per group) by a team of psychologists, occupational and physical therapists, nurses, and physicians. It included physical exercise, skills training, and education designed to explicitly enhance the key processes of PF. * Physical therapists helped patients to approach or feel physical sensations that represent a natural part of functional movements, to reverse goal-interfering avoidance of physical movement, to practice awareness of the experiences that appear when they do that, and to clearly see relations between physical movements, physical exercise, and goals and values. A small amount of teaching on movement and pain was also included. 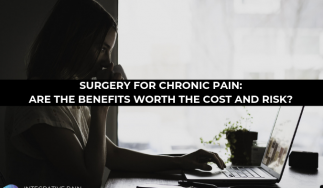 Clinically meaningful improvement* on each measure of outcome: BPI (pain-related interference), WSAS (functional impairment), and PHQ-9 (depressive symptoms), was noted in 42.0% to 67.5% of participants at post-treatment, and in 46.5% to 56.3% of participants at follow up. Clinically meaningful worsening* of BPI, WSAS, and PHQ-9 was seen in 6.6% to 9.4% of patients at post-treatment, and in 7.0% to 14.1% of patients at follow-up. Patients that worsened their symptoms also showed a reduction in measures of pain acceptance and self-as-context at both post-treatment and follow-up. * Defined by improvement/worsening greater than one-half of a standard deviation -a measure of data dispersion around the pooled mean score- from baseline. Despite substantial improvement in all pain-related measures, the study showed that the overall improvement in self-as-context was relatively small, and decreased slightly at follow-up. This is not completely unexpected, because self-reflection is arguably one of the most difficult psychological processes to engage in and maintain over time (7). There is also a lot of variability in people’s dispositions to open up and to willingly undermine the noxious entanglement of one’s thoughts and feelings (cognitive fusion) that often accompanies chronic pain (8, 9, 10). The authors point out that self-as-context training in the program may have been insufficiently addressed, and speculate that some aspects of ACT, including self-as-context, may be best delivered on an individual basis, rather than the study group format. Nevertheless, the results of the study align well with previous reports showing that moving from self-as-content to self-as-context improves emotional and physical function in patients with chronic pain, while alleviating symptoms of depression (11, 12). The study adds further to the mounting evidence on the effectiveness of ACT in treating chronic pain (13). To learn more about ACT for Pain and training for practitioners click here! 1- Hayes, S. C., Luoma, J. B., Bond, F. W., Masuda, A., & Lillis, J. (2006). Acceptance and commitment therapy: Model, processes, and outcomes. Behaviour research and therapy, 44(1), 1-25. 2- Yu, L., Norton, S., Harrison, A., & McCracken, L. M. (2015). In search of the person in pain: A systematic review of conceptualization, assessment methods, and evidence for self and identity in chronic pain. Journal of Contextual Behavioral Science, 4(4), 246-262. 4- Hayes, S. C., Wilson, K. G., Gifford, E. V., Follette, V. F., & Strosahl, K. (1996). Experiential avoidance and behavioral disorders: A functional dimensional approach to diagnosis and treatment. Journal of Consulting and Clinical Psychology, 64, 1152–1168. 5- Yu, L., McCracken, L. M., & Norton, S. (2016). The Self Experiences Questionnaire (SEQ): Preliminary analyses for a measure of self in people with chronic pain. Journal of Contextual Behavioral Science, 5(3), 127-133. 6- Yu, L., Norton, S., & McCracken, L. M. (2017). 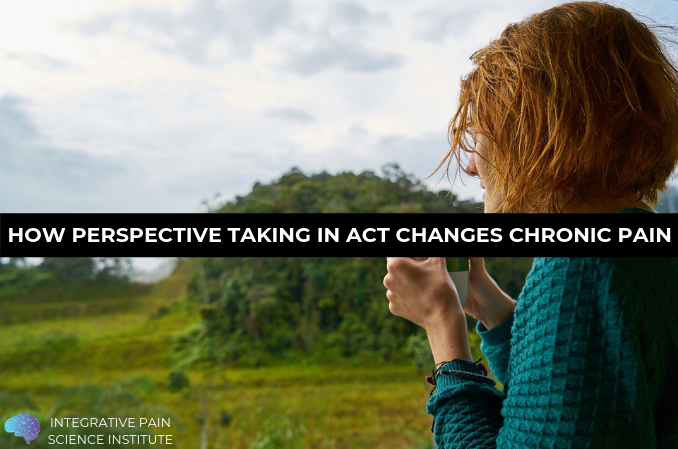 Change in “self-as-context” (“perspective-taking”) occurs in acceptance and commitment therapy for people with chronic pain and is associated with improved functioning. The Journal of Pain, 18(6), 664-672. 7- EE- Byrne, A. (2011). Knowing that I am thinking. Self-knowledge, 105-124. 8 – Tang, N. K., Goodchild, C. E., Hester, J., & Salkovskis, P. M. (2010). Mental defeat is linked to interference, distress and disability in chronic pain. Pain, 149(3), 547-554. 9- Morley, S., Davies, C., & Barton, S. (2005). Possible selves in chronic pain: self-pain enmeshment, adjustment and acceptance. Pain, 115(1-2), 84-94. 10- Hazeldine-Baker, C. E., Salkovskis, P. M., Osborn, M., & Gauntlett-Gilbert, J. (2018). Understanding the link between feelings of mental defeat, self-efficacy and the experience of chronic pain. British Journal of Pain, 12(2), 87-94. 11- McCracken, L. M., Gutiérrez-Martínez, O., & Smyth, C. (2013). “Decentering” reflects psychological flexibility in people with chronic pain and correlates with their quality of functioning. Health Psychology, 32(7), 820. 12- Yu, M. (2017). The Effects of Mindfulness on Self-Rumination, Self-Reflection, and Depressive Symptoms: A Research Proposal. Behavioural Sciences Undergraduate Journal, 3(1), 1-7. 13- Feliu-Soler, A., Montesinos, F., Gutiérrez-Martínez, O., Scott, W., McCracken, L. M., & Luciano, J. V. (2018). Current status of acceptance and commitment therapy for chronic pain: a narrative review. Journal of pain research, 11, 2145.